The Town of Mamaroneck Board has approved a 2.5 percent increase in water water bills, effective immediately. A representative from the Westchester Joint Water Works explained that the increase was due to the need of infrastructure improvements which include new computer systems and security improvements. An average home, now paying $800/year, will see a $20 increase. The Board also approved a resolution to end the sale of hunting and fishing licenses in the town. Board members discussed the excessive labor required to process the permits, while pointing out how little revenue was actually generated. It was also noted that there are several other options for obtaining a permit, including local shops and the State of New York. This past Monday, at the Village of Larchmont Board of Trustees meeting, plans for the pilot bike program were confirmed. The proposed project is expected to start in the spring of 2017, with talk of beginning the program on Larchmont Avenue using “sparrows”, a marking system with indications as to where the bikes should travel. The majority of the trustees and Larchmont families alike were supportive of the program with residents pointing out the environmental and safety benefits that the trial program would bring. The Harbor Coastal Zone Management Commission or HCZMC, led by Chair Cindy Goldstein, held a meeting on Wednesday that lasted over five hours. The meeting was devoted to going over the consistency review from the Army Corps of Engineers (ACE) Flood Mitigation Plan with the Local Waterfront Rehabilitation Plan or LWRP. The project, which has been in development since the 1950’s, is targeted at finding solutions to reduce flooding from the Mamaroneck and Sheldrake Rivers. The project started gaining traction in March 2010 after the efforts of US Senator Chuck Schumer, Congresswoman Nita Lowey and State Senator George Latimer. The cost of the project was agreed to be financed federally by 75 percent of funding and non-federally by 25 percent coming from the NY Department State of Conservation, the county and the Village of Mamaroneck. The LWRP is a document that consists of 44 policies, which is aimed to promote a balance between economic development and preservation of our coastal resources. By federal mandate, every city that is surrounded by water must be regulated by an LWRP. The Army Corps Flood Mitigation Plan for the Sheldrake and Mamaroneck Rivers would have a direct impact on the residents of our community, the ecosystem and surrounding waters, but before the project can move ahead, it is mandatory that the HCZMC has to recommend whether the project is consistent with the LWRP. However, the Department of State performs the final consistency review. During the meeting, the Army Corps presented the reasons why their plan is consistent with the LWRP. Residents were given opportunities to ask questions about the preservation. Following the questions from the residents, consultants hired by the HCZMC, gave a presentation that highlighted their recommendations. Despite the criticism toward the project, the Army Corps confirmed their position. The meeting which ended at 12:40 a.m., without yielding a yes or no decision. HCZMC Chair Cindy Goldstein was in agreement with members of the board in the use of the words “potentially consistent” in their recommendations with seven policies pertaining to the environment and the ecosystem. In our Round Table discussion, Maura Carlin spoke with Richard Slingerland, Village of Mamaroneck Manager; Tony Gelber, Village of Mamaroneck Chair of the Advisory Flood Mitigation Committee to get an update on the flood mitigation plan. Last week, twenty Argentinian students who are currently studying at Iona College joined The Local Live production team. The students and three of their teachers were part part of a media camp that focuses on mass communications. The Local Live’s Mike Witsch spoke with some of the students at Iona’s TV studio. Our Pet of the Week is Billie Jean, an adult female Pitbull Terrier. She enjoys walks, playing with her tennis balls, and snuggling. She is house trained and is looking for a loving home. For more information on Billie Jean or to look at other adorable pets, go to www.humanesocietyofwestchester.org. If you like our show and want to help keep it on the air, please go to our website, www.lmctv.org, and click on the DONATE button. We appreciate any donation. 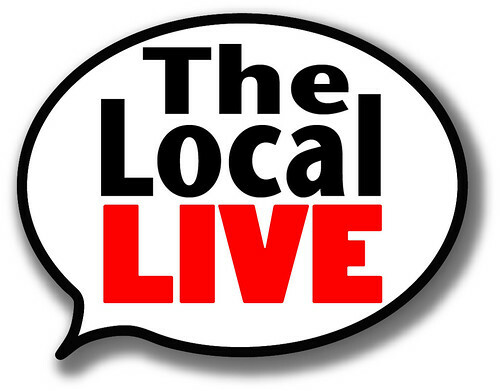 We’re always looking for volunteers and interns, so send your emails to thelocallive@lmctv.org. We love hearing from you. The Local Live Production Team would like to express our condolences to the families, friends and communities that were affected by the violence in Orland,’ the shooting of Alton Sterling in Baton Rouge, Louisiana, and Philandro Castile in St. Paul, Minnesota, and the recent killing of Dallas Police Officers, Brent Thompson, Patrick Zamarripa, Michael Krol, Loren Aherns, and Michael Smith. Our Round Table discussion will discuss these stories as well as gun control with some local residents. A candlelight vigil for the Dallas police officers is to be held at the Village of Mamaroneck Courthouse on Friday, July 15th at 8 p.m.
There’s a new favorite place to get ices and ice cream in Mamaroneck. Ralph’s Ices, which opened on April 29th, is located on 946 East Boston Post Road, has become very popular since its opening, although the long lines and no open parking spots have become a concern to residents in the neighborhood. They complained to the Village of Mamaroneck Board of Trustees at the meeting on July 11th about loud noise, traffic congestion and fast moving cars. The owner of Ralph’s, Scott Rosen, addressed the problems by suggesting to solve both parking and garbage clean up. He also argued that the neighborhood has thrown several unfair obstacles his way. During the meeting the Board heard more noise complaints regarding Mamaroneck Avenue restaurants and cabaret licenses for outdoor seating and live music. The Board passed three resolutions pertaining to cabaret licenses and noise, which will regulate outdoor seating in addition to live music played outside restaurants. The Board set a maximum loudness level from noon to 10 p.m. Live music at restaurants with cabaret licenses is limited to 75 decibels. That’s louder than normal conversation but below the level of an average household dishwasher. The trustees also raised fines and- for the first year, decided to end both Mamaroneck Summer Block Parties at 10 p.m.
Also in Village news, former Democratic chairman, Stuart Tiekert collected 288 signatures, which is the minimum number needed to enter the Democratic race for a Board of Trustees position. A long-time member of the Mamaroneck community as well as an advocate for local zoning laws, he will join fellow Democratic candidates, Victor Tafur, Keith Waitt, and incumbent Leon Potok. Sarah Bauer, the Leader of Preserve Larchmont, lives behind the 120-year-old house located at 40 Ocean Avenue. After hearing about the plan to demolish the house and subdivide the property for 4 new homes, she fought successfully to end the process. The Village of Larchmont Board of Trustees has now extended the original development moratorium, which will allow more time to search for resolutions that will regulate zoning and future land use applications. She spoke to the Local Live about the mission of Preserve Larchmont. Pokemon Go, Nintendo’s newest game app has taken over Mamaroneck. The game reached number one on iTunes with nearly 7.5 million downloads. Before launching the app, Nintendo’s stock dropped dramatically. Since the release, their stock has increased by 25 percent. Law enforcement is concerned over the game’s popularity due to dangers of being robbed while using the app. Critics of the game complain about faulty serves and excessive data usage.The Local Live spoke with local fans of the app. In our Round Table discussion, Maura and James spoke with local residents, Greta Manekar, Mamaroneck High School Junior; Kevin Duarte, NYU Student and Mamaroneck resident; Mike Rivers, Mamaroneck Resident; Mary Lee Berridge, Larchmont-Mamaroneck Interfaith Council; and Lee Stringer, author of Grand Central Winter; about the recent violence in our country. Our Pet of the Week is Grayce, a grey short-hair Tabby kitten. According to her foster family, she is very playful, affectionate and smart. She recently returned to the shelter, but she would be great in a family environment and is looking for her forever home. She is current with her vaccinations and is house trained. For more information on Grayce and other pets, go to www.humancesocietyofwestchester.org. Mike Witsch welcomed students from Argentina. They visited our set and watched us tape the show. If you like our show and want to keep it on the air, please check out our website, www.lmctv.org and click on the DONATE button. We appreciate any donation. We’re always looking for new volunteers and interns, so send your emails to thelocallive@lmctv.org. We love hearing from you. This past Wednesday, the Village of Larchmont Board of Trustees held a public hearing regarding the extension of the duration period of the moratorium until October. The moratorium was executed as a result of the increase in reconstruction and subdivision of several properties in the Village. It was originally administered in January as a direct result of the KOSL Building Group’s plan to tear down the 120-year-old home on Ocean Avenue. KOSL founder, Bobby Ben Simon purchased the $4.7 million property with the intent to subdivide it into four separate homes. The six-month moratorium was put into effect to postpone plan approvals for demolition permits for 40 Ocean Avenue, as well as other properties. The reconstruction agendas incited a major public response from both the Larchmont Historical Society and Preserve Larchmont. They argued that the reconstruction and subdivision of the homes devalues other residences in the neighborhoods, contributes to school overpopulation, as well as increasing flooding and sewage problems. Larchmont drivers may soon have to share the roads with bicyclists. According to lohud.com, the Village of Larchmont Board of Trustees is contemplating a pilot program that would create bike lanes on a busy section of Larchmont Avenue from Boston Post Road to Magnolia Avenue. The lanes would be five feet wide and would be included between street side parking. This would take up to nine feet of curb and the twelve foot wide single traffic lane in the center of the street. During the June 20th presentation, Recreation Committee Chair Carolyn Lee, stated that Larchmont Avenue was the perfect location for the pilot program since it connects people to the schools, businesses, as well as the library and other places in the Village. The Village Board is currently considering comments from the residents on this issue. We will continue to follow this story and bring you any updates that develop. Last Friday, the Mamaroneck School Board elected officers for the 2016-17 school year. Positions were chosen for president, vice president and secretary of the Board of Education. Seventeen appointments were also made for various administrative positions throughout the district including new district clerk, Joanne Rice. Melany Gray, who had previously held the position of vice president of the Board of Education, will now serve as president for the upcoming year. Gray has been a very active member of our community where she has been a PTA leader, a reporter with the Larchmont Gazette, and a volunteer in a variety of other community organizations. Steve Warner was elected as vice president. Warner has been involved with the Mamaroneck Schools Foundation and the Mamaroneck Library, where he served as treasurer. This will mark his third year on the board. Paul Bulova was elected secretary. Bulova is a member of the School-Based Health Center Task Force and the Mamaroneck Avenue School PTA. Congratulations to all of the newest board members. The Village of Mamaroneck is currently investigating a complaint made to the Daily Voice by one of the residents. The complaint referred to a local police officer who set off his own large private fireworks display on July 4th. According to the resident’s complaint, the fireworks display in the officer’s yard on Raleigh Road has continued to grow each year and could be potentially dangerous to everyone in the surrounding neighborhood. Both Mayor Norman Rosenblum and Village Chief of Police Christopher Layee are doing their best to look into the matter and resolve the situation. A pilot for the new TNT show, “Civil” was filmed in the Village of Mamaroneck this past Tuesday. The show which was directed by Allen Coulter, is about a modern-day civil war, a consequence of polarized politics. Coulter also directed and produced Remember Me, Hollywoodland and The Sopranos. The pilot’s cast includes Eliza Coupe, Bradley Whitford, Toby Jones, Enrique Muriciano, Brian d’Arcy James and Courtney B. Vance. Lohud.com reported that the actors were spotted filming a scene outside the United Methodist Church on Boston Post Road on Tuesday morning and also the at the Carvel later that day, according to crew members. The show is expected to air on TNT in 2017. In our Round Table discussion, Maura Carlin and Mike Witsch spoke with Fleriser Bello, President, Fleriser Bello, Inc. and CEO & Founder, Bellas Fashionistas, Latina Fashion Blog; and Yoga Instructor, Maria Smith about their attempts on living the American dream. The Village of Mamaroneck has lots of programs that provide residents with new and exciting things to do. For our “In the Spotlight” segment, Marcella Milder and Andrew Rio tell us about kayaking on the Long Island Sound. Our Pet of the Week is Ozzy, an adult male Yorkshire Terrier-mix. While he may resemble a little werewolf, he is actually very friendly. He is seven years old and weighs six pounds. He loves people, is a great cuddler and he’s a bit of a social butterfly. For more information on Ozzy and other adorable pets, go to www.humanesocietyofwestchester.org. We’re always looking for new volunteers and interns, so please send your emails to thelocallive@lmctv.org. We love hearing from you.